Handmade Boho Beaded Cotton Eyeglasses Cord in Gray, "Focus in Gray"
Read your favorite novels or newspaper in style with this colorful cord for eyeglasses by Thanadol. The Thai artisan adorns the long grey cord with colorful cotton fabric and adds beads made of glass and brass. The length is adjustable with a sliding bead. 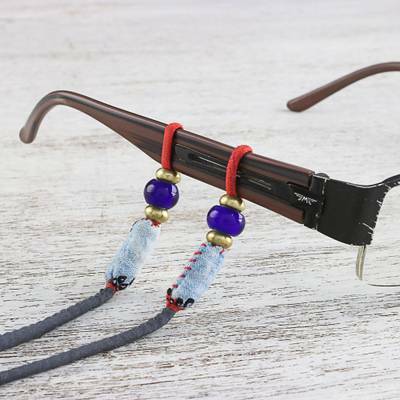 You can find beaded cotton eyeglasses cord 'Focus in Gray' by Thanadol in accessories categories such as Bohemian Other Accessories, Brass Other Accessories and Cotton Other Accessories. Enjoy exploring these sections for other Novica treasures. I love the colors and hint of beading on the ends. I do have to keep tightening the beading as the red loops slip, especially when glasses are hanging, it's easy enough to do, just wish I didn't have to tighten. “Hello! My name is Thanadol Chomphukham, or you can call me ‘Kob.’ I was born in Chiang Mai and never left my hometown. I studied industrial design and finished with a High Vocational Certificate. “I’ve been interested in jewelry design since I was young, and I intended to study industrial design with a focus on jewelry. After graduating, I tried to design some necklaces and bracelets from indigo-dyed cotton rope for myself, but didn’t start making them to sell yet. Then my close friend from Japan saw what I wore, and he really liked it and wanted my products to sell at shops in Yokohama and Kyoto, Japan. That’s when I started to work at my craft. I made the orders and shipped to Japan for a couple years, and then I started my own shop in the heart of Chiang Mai. “The first products I designed were necklaces, bracelets, anklets, and earrings made from indigo-dyed cotton rope decorated with hammered silver pendants, Karen silver beads from Lamphun province, and red thread that contrasted with the indigo-dyed cotton rope. “I compare my products to foods; I’m like the chef who has to create new menus and ingredients, then cook the dish that will showcase my own unique taste. “I use various types of materials, such as kimonos (a traditional Japanese garment), cotton fabric from northeast Thailand, printed cotton from Chiang Mai or Africa, glass beads, brass beads, gemstones, etc. I think delicacy and design are my specialties. “When I get orders from my customers, first I’ll design a prototype and let customers give feedback and revise as they want. If they’re in small quantities, I’ll make them all by myself, but for larger orders I have my small team make the pieces. My team includes my younger sister and a neighbor in my village, and our work affords them a better living. I’m the one who is preparing all the materials and suggesting techniques and processes to them. At the final stage, I’ll quality-check every piece again before delivering it to our customers.